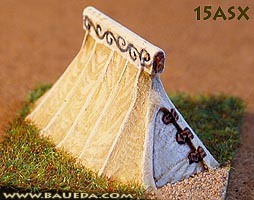 15mm Anglo-Saxon Tent AVAILABLE NOW! This Anglo-Saxon tent, called "Geteld" is based on many available sources. It is designed to be used as a baggage element for any Anglo-Saxon army and to fit on a standard 40x40mm DBM baggage base. Tents were used by both Vikings and Saxons. 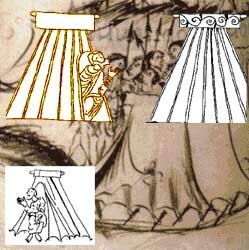 The tents used by Anglo-Saxons are well known from literature and illustrations, but completely unknown from archaeology. This means that, although we know what they looked like, we do not know of what they were made. 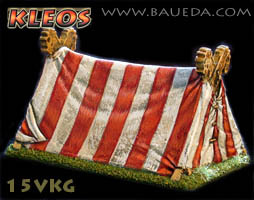 Illustrations of these tents are remarkably consistent in the type of tent they show, they appear to be identical to the tents used in the rest of mainland Europe at this time, and therefore are really suitable for most nations and armies of this period. Anglo-Saxon tents appear to have been mainly used for armies on the march, the very word camp is an Old English word meaning 'battle or warfare', although it appears they may also have been used by other people when away from home, for example, traders, farmers out slaughtering animals, etc..
15ASX is available in three finish: simple plain cast, as it comes out of the mold; cleaned and primed, based and ready to paint; or as a finished DBM baggage element, painted, based and flocked to the very same standard you see in the picture! 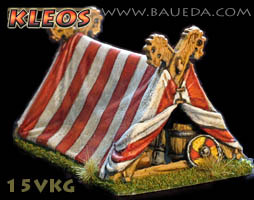 15mm Viking Tent AVAILABLE NOW! 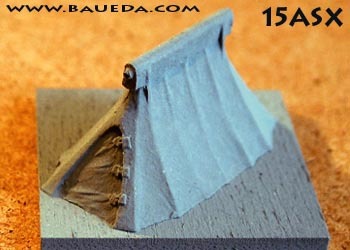 This Viking tent model is based on the frames recovered from the Oseberg and Gokstad ship burials. 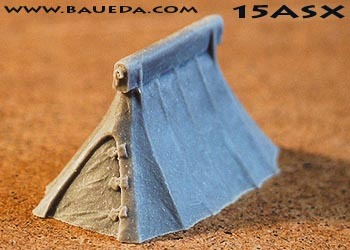 It is designed to be used as a baggage element for any Norse and Viking army and it is approximately 40mm wide, 65mm deep and 37mm tall, so fits on two standard DBM baggage base, that is 80x40mm. The gable boards survived in relatively good conditions. They are made of oak terminating in fierce, carved animal heads. It is thought that most Viking ships probably carried some tents of this type to provide shelter, at least for the more important members of the crew, when the ship was away from home. These tents varied considerably in size, some of them being large enough to have a fire inside! Unfortunately, we do not know exactly how the canvas fitted to these tents, or indeed, if they may have just used the ship's sail to cover the frame. These tents may well have functioned as a 'market stall' when the ship's crew were engaged in trade, although they could equally well have provided shelter for soldiers on campaign. We do not know much more about Viking tents because they do not seem to be illustrated in any contemporary pictures, or mentioned in any contemporary literature. 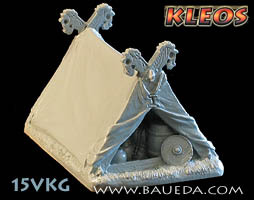 15VKG is available in three finish: simple plain cast, as it comes out of the mold; cleaned and primed, based and ready to paint; or as a finished DBM baggage element, painted, based and flocked to the very same standard you see in the picture!